We thought you could use a dose of good news about the environment, so we’re pleased to introduce Leigh Calvez, a citizen naturalist here to offer us a report from the whale front. 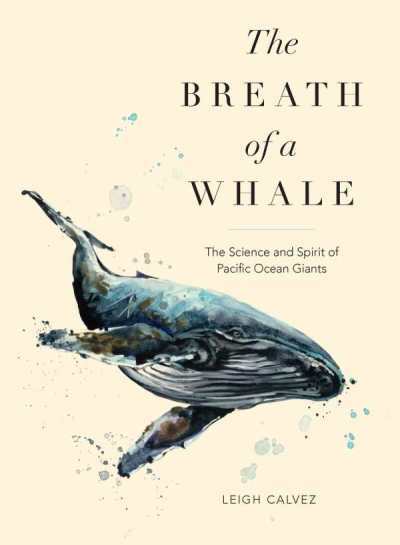 The author of The Breath of a Whale: The Science and Spirit of Pacific Ocean Giants, Leigh acknowledges that it’s easy to get dragged down by climate change, overfishing, and other depressing ecological realities, but that there’s a lot to be positive about, too. 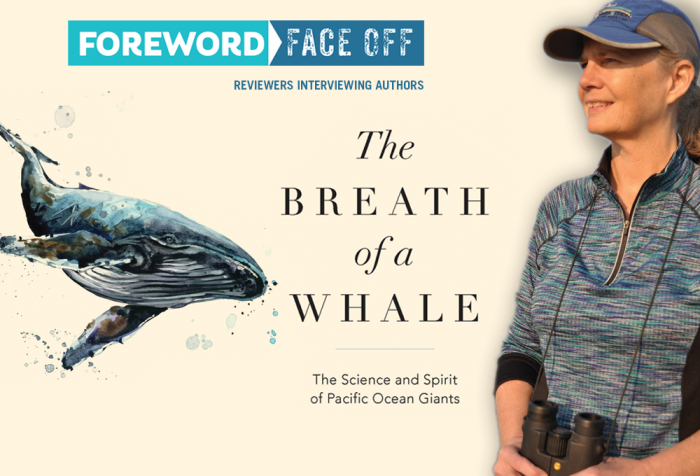 Anna gave The Breath of a Whale a glowing review in the March/April issue of Foreword Reviews, and jumped at the chance to engage with Leigh, so the good people at Sasquatch Books helped us set up this interview. Take a break from doom and gloom for a few minutes, and feel some whale love. Take it from here, Anna. Thanks for sitting down with us today! Have you kept up with the whales? Yes! For me, it seems like whales are in the news every day, so it’s pretty easy to keep up with them, especially the orcas here in Puget Sound. In January, a whale named Matia, also known as L77, had her third calf. Only one of her previous children has survived so far, so she’s already got a seven year old daughter. But her new calf seems to be fine, very healthy and energetic. We’ve got our fingers crossed for his future. It’s been really hard for the calves to survive these last years. We’re keeping an eye on them. I also keep up with Robin Baird, who studies deepwater whales off Hawaii and is featured in The Breath of a Whale. He reported on Facebook that the southern exclusion zone for fishing around the Hawaiian Islands will be closed because of the death and injury of false killer whales. They’re seeing if they can find a way to make fishing gear more efficient, get more supervision and training on the equipment, that kind of stuff. Then I saw that a humpback whale traveled from Canada to Hawaii carrying crab pods. I don’t know how the whale made it. It’s a very serious situation for that particular animal. Some of the crabbing gear has been embedded in the animal’s skin and researchers don’t know if they can get it completely disentangled. That’s a sad piece of news, but it’s also an example of how these whales just go on, even dragging entangled gear. Also, if we can disentangle them, they usually have good outcomes. What were your goals when you were writing The Breath of a Whale? I never know who’s going to read a book. I don’t know what they know about whales. A lot of my purpose was education. I wanted to inspire people with an admiration for these animals. They’re just amazing, and I wanted to communicate that to people. For people who didn’t know anything about whales—it’s hard to believe that someone wouldn’t, but it’s possible—maybe my book could be their first take. For people who know a lot about whales and what they’re up against, I wanted them to know that things are not all bad. In this book, I’m looking for the good, what’s working, and what’s still beautiful about the world. That’s really important to me. There are still serious conservation issues at stake, as we just talked about. But I wanted to provide some hope. Not a fairy tale, but how I’ve learned to gather hope for myself. You take a personal approach to natural observation. How do you see your perspective getting to the public and changing awareness? Conservation is personal. The environmental movement is personal. We get upset when there’s a tragedy, like a hurricane or an earthquake somewhere. We really respond to that. When we hear about the whale carrying her dead calf for seventeen days, we respond personally to that too. The environment is where we live. It’s our home. We tend to think we’re separate from it, but we’re not. It’s really easy to get sucked into the fear and despair of ecological destruction. My personal story is how I learned to deal with that and what I had to go through to get there. I really believe that our negative thoughts and feelings are as toxic to our bodies and our minds as the pollutants in the environment. We’re someday going to realize that they can be just as hazardous. Are we hurting ourselves by hurting the planet? Yes, absolutely. We ARE the planet. We have all these dreams about going into space and living on these other planets and we’re still just scratching the surface of what this planet does for us. The way it makes oxygen for us to breathe, the way it creates water for us to drink, the way it provides food. It’s mind-blowing if you sit down and really think about it. And yes, we need to realize that we’re living with difficult feelings about the damage we’ve done to the Earth. The feelings we have about it are like what a victim of abuse feels, and most of us don’t even realize. We have to come to that understanding. We have to understand how fear and anger pollute our bodies and our minds and stop us from doing anything about the problems we face. How would you advise a reader to get more engaged in the environment? Spend as much time in nature as possible. Research. Watch documentaries, read books about anything that inspires you. I think we have to start there, with what inspires us, what really makes us happy and joyful. If birding is your thing, learn about birds. There is so much citizen science going on with birds, much like what’s happening with whales, but citizen science covers many species. Earthwatch, for example, is a great organization that takes ordinary people on research trips and puts them to work helping researchers gather data. The whale watching organization that I talk about in the chapter on grey whales draws people from around the country. They come to learn about the whales and then they become volunteer naturalists for the program. I find that really exciting. I heard a story about a fourteen-year-old girl who rode across the country on her bicycle with her dad to raise awareness and funds for orca conservation. Her passion was cycling, she loved to do that with her dad, and she combined that with orca awareness. You can take anything you’re passionate about and combine it with a species you’re in love with. There’s a myriad of ways to do environmental work and that creativity is healing. Your book had a few examples of large institutions, like the military, that are important to us human beings but which sometimes roll over the well-being of whales. How do we get our systems to prioritize nature? That is a really good question and something that I’ve been wrestling with for a really long time. I’ve been around the environmental movement for most of my adult life. Systemic change takes time. The more conscious we become as individuals, the more conscious our institutions become. They are us. It just takes a while. I have seen systems change. When I first became aware that LFA (low frequency active) sonar was affecting humpback whales, that project was very hush-hush. The military didn’t want anybody to know about LFA. Just bringing that information forward was a challenge at first. Later it wasn’t such an obstacle. I once had a neighbor ask me if I knew about LFA sonar, which thrilled me. I was like, yes! I do! What do you know about it? It just takes time for big systems to change. The orphaned orca Springer’s story is a really great example of how institutions like the National Marine Fishery Service can learn to work with whales and with researchers. Initially, NMFS didn’t want to get involved in Springer’s case, but we pressed them into action and they did save that whale. She’s out there swimming today with her two calves, wild and free. I think our attitude toward marine parks is changing too. Over the span of, say, 25 years, keeping orcas in captivity has become less acceptable than it used to be. That kind of shift doesn’t happen as fast as I want it to. I get very impatient and I have to remind myself what we’re dealing with. That’s when I go out for a walk, out into nature. Look at what’s good and right and beautiful. It does change. It will change. How do you maintain your emotional stamina despite the difficulty of environmental activity? Environmental conservation is life and death. I came close enough to death myself that I understand this deeply. I don’t let myself spend too much time in the negative emotions, like anger and fear. If I start to feel guilty—as I do, I can go there in an instant—I go directly to the ponopono prayer that I discuss at the end of the book. I’m sorry, please forgive me, thank you, I love you. I just say that over and over. It’s like a meditation. I repeat it until I start to feel better, until I can start to feel that forgiveness. Sometimes this is a daily thing. I constantly remind myself to look at the beauty of the trees, the whales. It’s a choice, a constant choice, to pick beauty over fear or love over fear. So what’s next for you? Are you planning another book? I am planning another book, I just don’t know what it is yet! I have several ideas running around in my head and I have to settle on one. It’s hard. There’s so much to do and so little time! It could be something about predators, possibly mid-level predators. We’ll see what comes out.